All glass types are delivered as sealed units and are installed and adjusted by our team of professionals. All glass types (except Integrated Blinds) can be fitted with Colonial grids or filled with Argon gas. 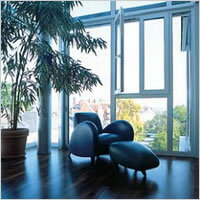 This is the most economic and popular glass type and provides all the basic thermal insulation and soundproofing needs. Thickness available are 4mm, 5mm, 6mm, 8mm and 10mm. Clear glass also comes in a toughened type. Tinted glass has been darkened to reduce the amount of the suns UV rays that enter your home. 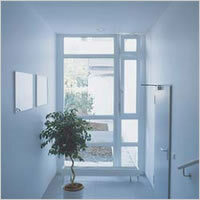 Obscure glass is also known as frosted glass and is typically used in bathrooms where privacy and light is required. Thicknesses available are 4mm, 5mm and 6mm. Obscure glass also comes in a toughened version. Acoustic requirements are met typically by using thicker types of glass. For example, to achieve maximum soundproofing properties, a window or door can be fitted with a double-glazed unit of glass where the outside sheet is 10mm and the inside sheet is 6mm thick. Special studio quality SoundControl glass can be used in severe cases. Low-e (Low Emissivity) glass is used to improve the thermal properties of windows and doors. The glass is typically used on North facing walls in Australia and helps a home retain warmth by allowing long energy waves (heat) to enter the house through the windows and doors and prevent these waves leaving. Good for warming cold houses. Bushfire glass is basically toughened glass with Low-e glazing on the inside surface. The outside pane of toughened is usually 10mm. This combination provides the best heat resistance. 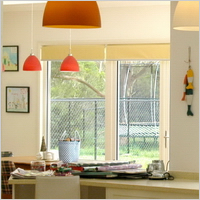 Integrated blinds glazing has Venetian blinds built-in between the two layers of glass. The blinds are controlled by magnetic sliders neatly built onto the surface of the glass unit. 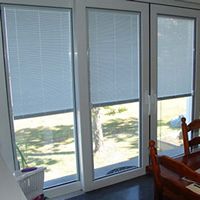 As the blinds are totally sealed within the units they require no cleaning or maintenance while providing shade. Toughened or laminated glass is required by law to be installed in all door systems and wet areas where the window is less than 2m from the floor. Thickness available are 4mm, 5mm, 6mm, 8mm, 10mm & 12mm. Toughened glass is also known as Safety glass. All glass types come in toughened variety.